20 Bamboo Clothes Pegs. Made from sustainable, biodegradable bamboo with a degradable steel spring, packaged in a recycled cardboard box. Avoid more plastic from entering landfill and go bamboo. 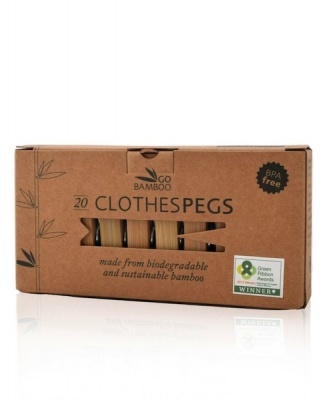 20 Bamboo Clothes Pegs by Go Bamboo. Made from sustainable, biodegradable bamboo with a degradable steel spring, packaged in a recycled cardboard box. Avoid more plastic from entering landfill and go bamboo. 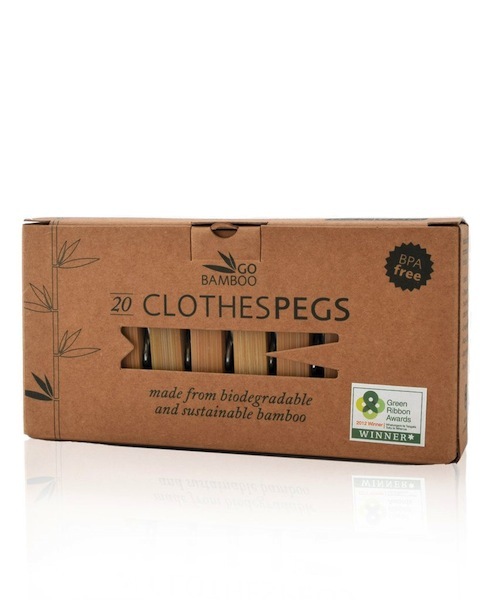 Bamboo clothes pegs are an environmentally friendly and sustainable alternative to plastic pegs and are incredibly strong and durable in harsh UV conditions. Bamboo naturally contains very few tannins (unlike wooden pegs) so won't stain your light coloured clothes. The bamboo cloth pegs may be composted and the steel spring can be separated and will degrade away. Bamboo is a sustainable product. It needs no pesticides or fertiliser to grow. It’s a super fast growing grass that is more efficient at taking CO2 from the air and producing more O2 than trees.